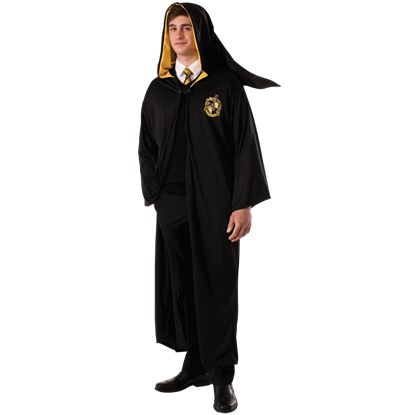 Become a member of the wizarding world for a day with our selection of Harry Potter costumes and masks. Dressing up as Dumbledore, a Death Eater, or the Boy Who Lived himself? We have the costume robes and high quality masks you need to make yourself into someone from Fantastic Beasts, Harrys years at Hogwarts, and beyond. Check out Voldemort latex hands to get a perfectly chilling grip to wear to your next magical event. Shop Tina Goldstein accessories that can transform you into the American witch or Newt Scamanders traveling coat from Fantastic Beasts and Where to Find Them. For those with more sinister plans, we offer Bellatrix Lestrange and Dementor costumes as well. 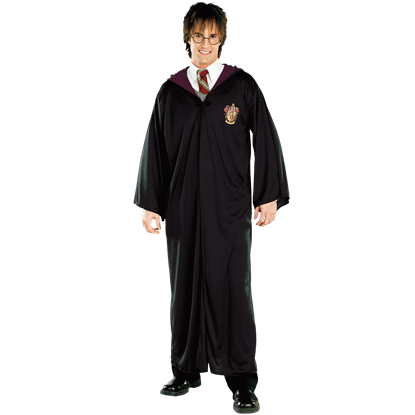 Find your place in the world of Harry Potter when you step out wearing our Harry Potter costumes and masks. Bellatrix Lestrange is a fantatic follower of the Dark Lord Voldemort. After escaping from Azkaban, Bellatrix fights against Dumbledores Army. This Adult Bellatrix Death Eater Costume is terrifying for Halloween or any event. The Death Eaters are the followers of the Dark Lord Voldemort. Even when they are in normal wizard attire, they can be identified by their Dark Mark tattoo. 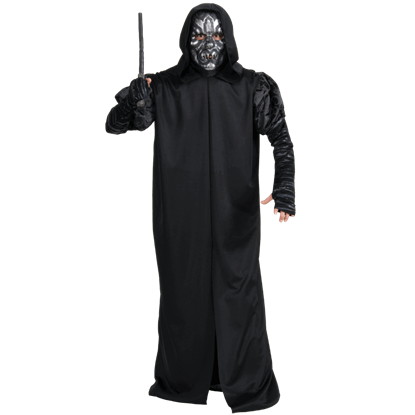 This Adult Death Eater Costume is terrifying for Halloween or any event. The followers of the Dark Lord Voldemort are known as Death Eaters. They practice the Dark Arts and fight against the Order of the Phoenix in the Wizarding Wars. 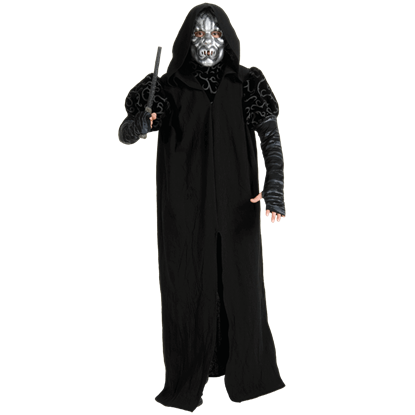 This Adult Death Eater Deluxe Costume is terrifying for Halloween. Dementors are the embodiment of nightmares in the Harry Potter wizarding world. They feed on human happiness, leaving behind only misery, and guard Azkaban prison. 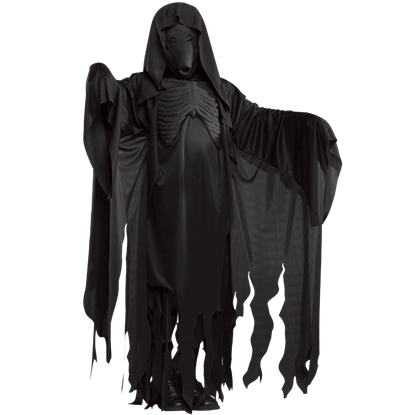 This Adult Dementor Costume is terrifying for Halloween or any event. 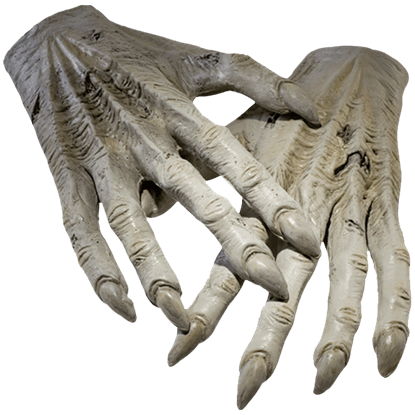 These skeletal hands add a creepy effect to your Dementor costume. The rotting flesh and color of death remind everyone that you are here to feast on their happiness. Wear these Adult Dementor Hands for Halloween or any event. When Harry Potter and his classmates arrive at Hogwarts, they are sorted into one of four Houses at the school. Harry is sorted into Gryffindor. 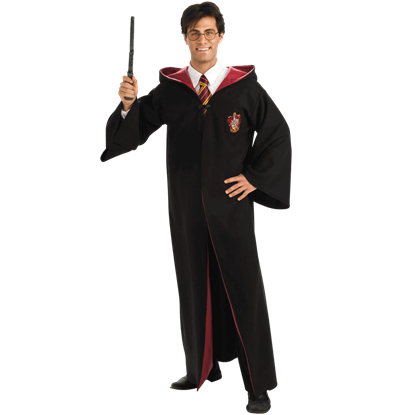 This Adult Gryffindor Deluxe Robe is a fantastic costume for Halloween or other events. Gryffindors emphasize courage, daring, nerve, and chivalry. Minerva McGonagall, Neville Longbottom, and Ginny Weasley are among their ranks in the Harry Potter series. This Adult Gryffindor Robe is a fantastic Halloween costume. Hufflepuffs value hard work, patience, loyalty, and fair play. Nymphadora Tonks, Cedric Diggory, and Professor Sprout are among their ranks in the Harry Potter series. This Adult Hufflepuff Robe is a fantastic Halloween costume. Ravenclaws value learning, wisdom, wit, and intellect. Sybill Trelawney, Cho Chang, Filius Flitwick, and Luna Lovegood are among their ranks in the Harry Potter series. 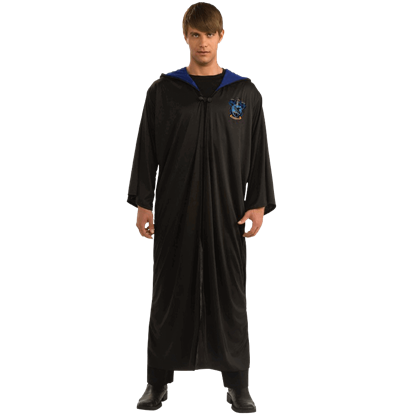 This Adult Ravenclaw Robe is a fantastic Halloween costume. Slytherins value cunning, resourcefulness, and ambition. Pansy Parkinson, Severus Snape, Vincent Crabbe, and Gregory Goyle are among their ranks in the Harry Potter series. This Adult Slytherin Robe is a fantastic Halloween costume. After Hogwarts, Tom Riddle studied the Dark Arts. He rose to power as Lord Voldemort and led the Death Eaters against the Order of the Phoenix. 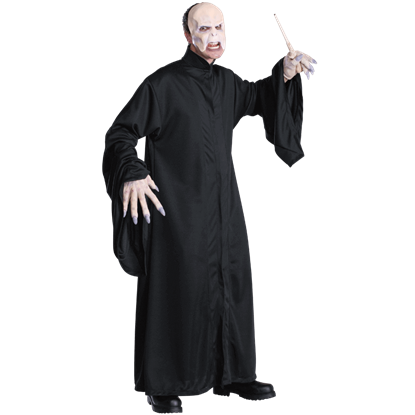 This Adult Voldemort Costume is a fantastic costume for Halloween or other events. Orphan Tom Riddle is invited to attend Hogwarts by Albus Dumbledore, who is unaware the boy would become the dark lord known as Voldemort. 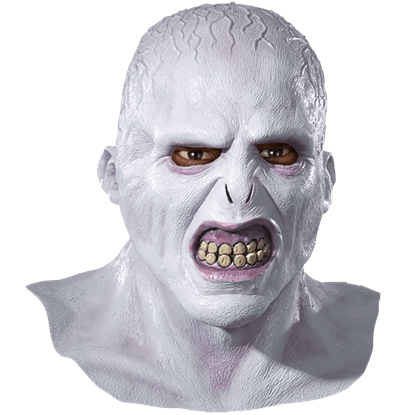 This Adult Voldemort Deluxe Latex Mask is a perfect addition to your dark wizard costume.